In this publication, Renate Mihatsch assembles nine contributions by artists, architects, musicians, and cultural and urban theorists who discuss recent discoveries in the fields of mobility, neo-nomadism, changing approaches regarding a sense of home and urban space. The grown archive of photos, dialogues, graphics and essays are the source for a mapping process which turns the collection into a territory in which the reader can stroll freely, is navigated by signs, reverse their steps and start anew. Discovering the spaces of the book also includes the possibility of ripping out the book's pages which can then be put together to form a large overall map. 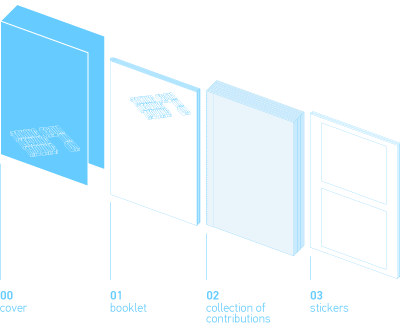 Taking FROM Leaving IN Moving ON – mapping Urban Nomadism consists of three parts: a thin booklet including a short introduction and abstracts of all contributions, the Japanese-bound collection of the contributions and a sticker insert, which is all held together by a lose cover and a rubber band.